Start the HK-Software Services Control Center, found in the IBExpert Services menu, and select IBExpert Backup Restore in the HK services list. We now need to configure the default task settings. We know that some parameters will remain the same for all further tasks (for example: Firebird Install folder, path to gbak.exe, SMTP settings, etc. ), so we should configure those first. Expand the DefaultTaskSettings item on the Service setup and control page. After configuring the default task settings, all new tasks will have this configuration when created. It is of course possible to alter specific options for individual tasks. When True then the task just created will be active. 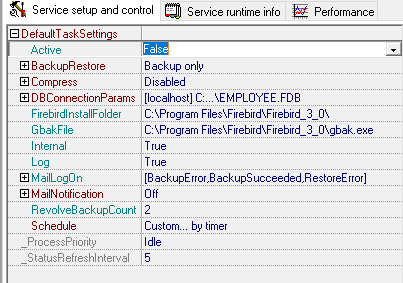 Restore/Enabled: when True, then service will restore a database from a successful backup file. This can be used to validate the backup file. If you need to perform any additional operations before/after the backup/restore (for example script execution, data validation, etc.) you may use the Actions options in the IBExpertBackupRestore service. The screenshot below shows the corresponding section with the BeforeBackup action expanded in SCC on the Service setup and control page. If you need to interrupt the backup/restore process because some data validation or other operation has failed, you can use the InterruptOnFail option of the corresponding action. The execution of any action will be recognized as failed if the executed program sets the exit code not equal to 0 (zero). The command line for each action may be configured using executable file parameters as well as with service macros. The macros will be replaced with corresponding values. %database Full connection string to source database. %restored_database Full connection string to restored database. %backup_file Path to backup file. 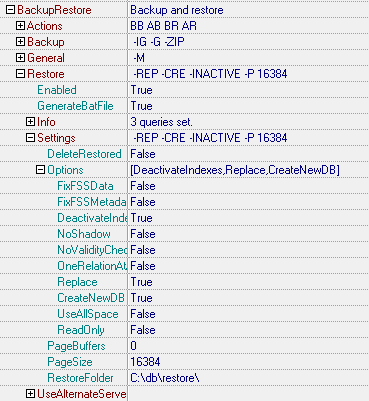 %role SQL role from DBConnectionParams. For example, such a configuration of a BeforeRestore action will always stop the service performing the restore, because the exit code of such an action will be 2. All actions with the corresponding results will be listed in the service report email message. In the Backup / Options section you can configure the backup options, which are those available in GBAK, as required by simply setting the corresponding items to True. Please take into consideration that if you are intending to follow the backup with an immediate restore over the existing database, then the garbage collection makes no sense. 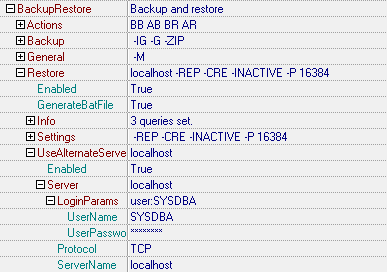 and the corresponding gbak command-line parameters under Backup. 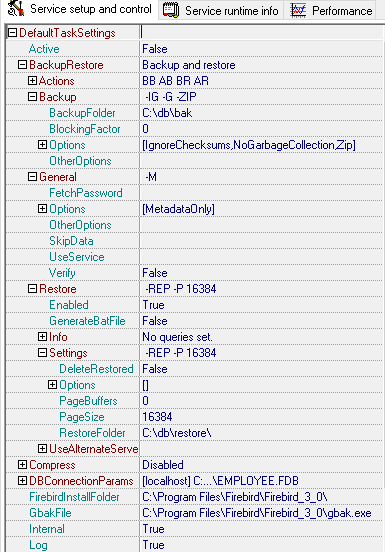 In the screenshots shown above you can see the backup configuration specified with the No garbage collection and Ignore checksum options. When Restore / Enabled is set to True, the IBExpertBackupRestore restore will perform a restore from the backup just made. This feature can be useful if you want to validate the backup file or wish to use the freshly restored database for better performance. 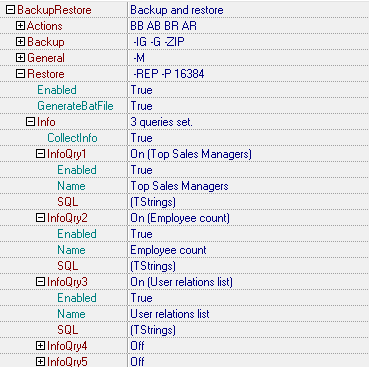 Restore / Info can be used to execute up to 5 different queries, enabling you to obtain useful information about the status of the database, for example, the record count of a particular table, the last logged update timestamp or some special report. When CollectInfo is set to True, the restored database's main parameters, such as fle size, page size, pages count etc., can be viewed, or stored in the log file. If you want make a restore just to validate a fresh backup file, you probably don�t need to store the restored database file. So it is even possible to configure IBExpertBackupRestore to delete the restored database file following the restore. Just set the corresponding option to True. Backup and restore is very resource-consuming operation. To help your main database server breathe more easily, you can set the service to perform restores on an alternative server. This can be done using the UseAlternateServer option found in the Restore parameters. When this option is enabled you can backup your database from one server and restore it to another. If you want to compress a successfully created backup file, you should use this configuration section. You can also configure the service here to delete the backup file, following the successful compression (DeleteBackupAfterCompress option). %backup Backup file name with extension. %compressed Compressed file name = backup file name + extension. %back_filename Backup filename without extension. The extension is configured in CompressedFileExt. You can also add a role; the SYSDBA user and masterkey password are the default. This is fairly self-explanatory, although should you require detailed information regarding Firebird/InterBase� database connection parameters, please refer to the online IBExpert documentation. We use gbak bacause it has all the functionalities from the newest Firebird version. You may use the mail notification feature if you want to receive reports about IBExpertBackupRestore's activity. The service sends an email message with log files attached when the backup/restore task is completed. To use the mail notification feature, the Enabled parameter in the MailNotification section should be set to True. IBExpertBackupRestore uses a built-in SMTP client to send emails, so you need to set up the SMTP parameters in the task configuration to enable this to work properly. Simply double-click on the SmtpSettings option, to open the configuration dialog window. 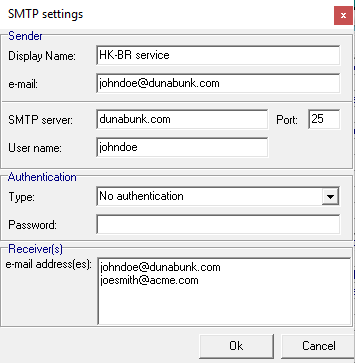 In this dialog you should set up the Sender, SMTP server configuration and one or more recipients. every day at the specified time. every nth day, starting from date. every given day of week. Every nth day of the selected months at the given time. Selected days of every week of selected months at given time. This parameter can be set to Idle, Normal or High (the default is Idle). Here the refresh interval in seconds can be specified (default value is 5). The path to the executable file, hkIBRS.exe is displayed. You can specify the Startup type selecting an option from the drop-down list (options: Manual, Automatic or Disabled). The Service Status can be viewed at the bottom of the window, and the Start and Stop buttons used to manually start or stop the service. Once you are sure you've configured your default settings as you need them, don't forget to save your configuration by clicking the disk icon in the toolbar, before moving on to configuring your individual databases for their backup.